German business confidence hit its lowest level in more than five years in October as the deepening financial crisis started to have an effect on the outlook for economic growth. 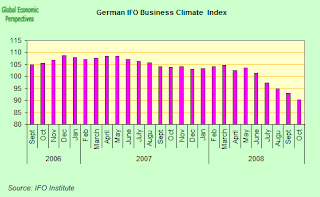 The Munich-based Ifo institute business climate index, which is based on a survey of 7,000 executives, fell to 90.2, its weakest reading since May 2003, and down from 92.9 in September. If we have a look at the evolution of the index sub-components, we can see that the retailing and construction sectors have long been plumbing the bottom. What is new over the last few months is that the manufacturing sector has steadily been joining them as export growth has weakened. 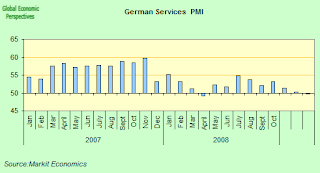 This means quite a sharp recession is on the way in Germany, in my opinion. Germany's leading economic institutes this month slashed their joint forecast for growth in what is Europe's biggest economy for next year, forecasting an expansion of just 0.2 percent in 2009, and even this may well turn out to be excessively optimistic - the risk of annual contraction is now a non-negligable one, especially if we are going by the Federal Statistics Office Non-calendar-adjusted reading, since there will be one working day less in 2009. Germany exports fell for a second month in August while German investor confidence dropped for the first time in three months in October, to near a record low. 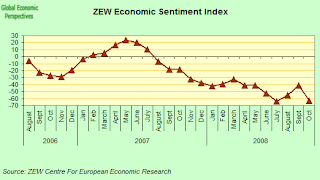 The ZEW Center for European Economic Research said its index of investor and analyst expectations slumped to minus 63 from minus 41.1 in September. The index all time low is minus 63.9 which was in July of this year.
" 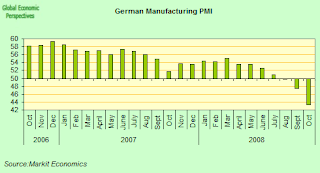 This impression is only confirmed by October's falsh PMI reading which indicated the sharpest decline in German private sector activity since mid-2003," Tim Moore, an economist at Markit Economics, said in a statement. 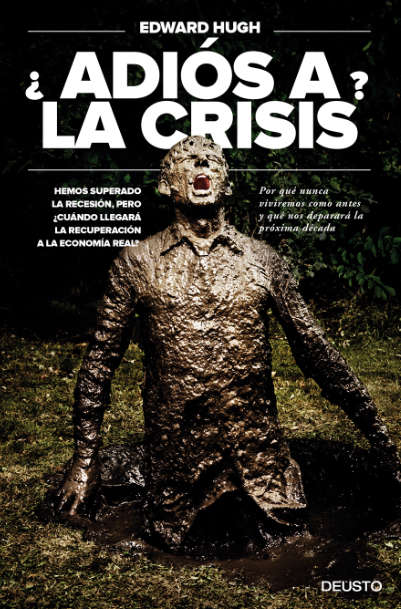 "Market demand was shaken by the latest global financial turmoil, as firms became increasingly concerned about the economic outlook and access to credit." The rate of expansion in the German economy seems to have dropped back to its lowest level in more than five years in October. The preliminary flash estimate of the composite purchasing managers' index for what is the euro zone's biggest economy fell to a 64-month low of 46.7 in October from 48.5 in September. Manufacturing activity in contracted for the third straight month with the reading plunging to 43.3 from a final reading of 47.4 in September. In addition, economic activity in the service sector stalled for the first time since January as the flash reading slipped to 49.7 from 50.2. However, the data showed input price inflation eased to its slowest for more than three years in October, with the month-on-month fall in the index was the largest since the series began in January 1998. This reinforces data out this morning (Friday) from the German Federal Statistics Office which showed that German import prices fell 1.0% month-on-month in September after declining 0.8% in the August, as crude oil prices continued to pull back from their record high in July. On an annual basis, the rate of import price increase slipped back to 7.6% from 9.3% in August. 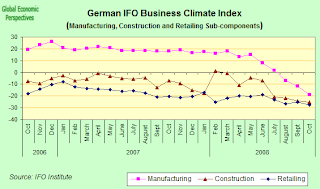 The data suggests that the German economy may well continue to be in recession in the fourth quarter (assuming that the forthcoming 3rd quarter data do show a contraction) as demand across the global economy continues to falter, a process which will hit an export dependent economy like the German one especially hard. 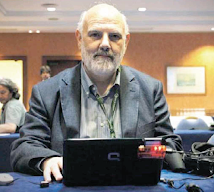 Disclosure Statement: Edward Hugh is a macroeconomist who maintains a premier set of blogs at Global Economy Matters and is a featured analyst at Emerginvest. 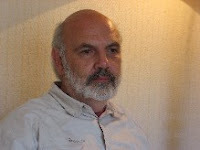 Edward Hugh provides non-partisan information about world stock markets, and does not have any holdings in foreign equities. The information stated above should not be construed as investment advice, and Edward Hugh is not liable for any actions taken on said materials.